Product information "Copper conductive paint (200 ml)"
This galvanic conductive paint on copper base from Tifoo allows you to plate works of art and gifts made of glass, pottery, plastic and a lot of other material with a bright layer of metal in a short time. Just apply a thin layer of the conductive paint with a brush on the cleaned surface. The copper conductive paste dries until rub-proff in 10 to 15 minutes and therefore allows a quick treatment of the workpieces. The complete drying for perfect resistance on stressed surfaces takes about 12 to 36 hours at room temperature. The varnish can be diluted with butyl acetate. In the next step, the object is connected to a wire and copper-plated in the acidic copper electrolyte from Tifoo. A resistant copper layer will then be deposited. The last step can be used for nickel-plating, silver-plating or even gilding! Thanks to its low price and the high electrical and thermical conductiveness, the conductive copper varnish is the perfect alternative to the conductive silver varnish. Please keep in mind that the first step has to consist in copper-plating in the acidic copper electrolyte because the conductive varnish won't be activated before. After copper-plating, the metal layer will be wear-resistant. 20 mL are enough for a surface of up to one square metre - very efficient! 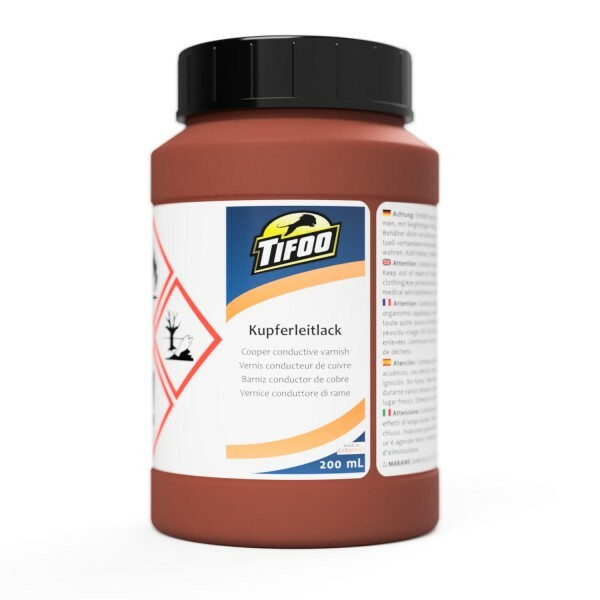 Related links to "Copper conductive paint (200 ml)"
Instruction manual for Tifoo Copper conductive paint (200 ml) as PDF file. Customer evaluation for "Copper conductive paint (200 ml)"